Engineered specifically for use with instrument amplifiers and other high-current equipment, the Furman P-1800 PF offers a stable, protected and filtered low impedance powered supply for maximum performance of connected electronics. 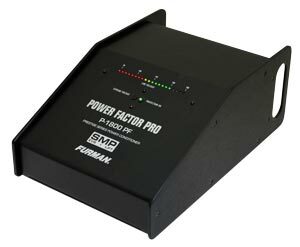 Furman's exclusive Power Factor provides a 45A peak current reservoir to minimize the detrimental effects of line impedance on high-current gear such as amplifiers and powered monitors. Clear Tone Technology provides additional line noise filtration tuned for instrument amplifiers for clean and consistent tone. Plus, equipment benefits from professional-level protection thanks to Furman's exclusive SMP and EVS technologies. Your amp needs a lot of power to sound its best. If you�re plugging into the wall, there�s a good chance your amp is not going to get the current it needs when pushed. Furman�s exclusive Power Factor Technology provides a 45A peak current reservoir to give your amp the headroom it needs to operate at maximum efficiency. No matter what venue or club, or how close or far away from the power panel, Furman�s Power Factor Technology keeps your instrument amplifier�s tone consistent and sounding it�s best. Clear Tone Technology works in unison with Power Factor Technology and Linear Filtering Technology to add an additional layer of AC noise filtration specifically engineered for instrument amplifiers. Clear Tone Technology provides tuned circuits that unveil instrument tone, harmonics, and clarity, resulting in a fuller sound and improved dynamic response.